Flowers appear when you least expect them, adding color and fragrance long after their spring-blooming counterparts have faded. Sparkling white hydrangea blooms burst open like fireworks in mid- to late summer. Shrubs that burst into bloom as the summer begins its slide into autumn breathe new life into the garden. Their flowers appear when you least expect them, adding color and fragrance long after their spring-blooming counterparts have faded into the background. Give some of these favorites a spot in your garden and you won’t be sorry. Hardy hydrangeas are common on old homesteads and cemetery hedgerows. 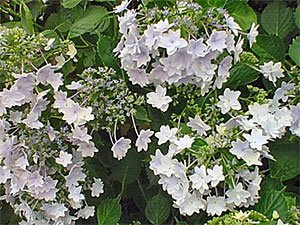 They set their flower buds in the spring and bloom the same summer, making them a good choice for cold-winter climates. 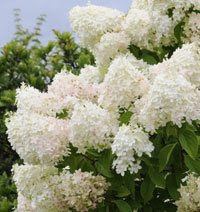 Pee Gee hydrangea (Hydrangea paniculata ‘Grandiflora’) is winter hardy to Zone 3 and isn’t too particular about soil conditions, as long as it gets regular watering. The puffy white flower heads mature to soft pink as they age. Excellent varieties include Limelight and Pinky Winky™. Caryopteris, also known as bluebeard, brings a hard-to-find blue color to the garden just in time to balance the late-summer yellow and orange of black-eyed susans (Rudbeckia) and perennial sunflowers (Helianthus). Hardy in Zones 5 to 9, they thrive in full sun. Clusters of blue flowers delight visiting butterflies, too. Its compact stature makes it useful for low, informal hedges or mass planting. Summersweet (Clethra alnifolia) has intensely fragrant white or pink flower clusters that feed bees, butterflies and hummingbirds. This native shrub grows in nearly every hardiness zone, requiring only moist, acidic, humus-rich soil to thrive. Visit North Carolina State University Extension Service for summersweet photos, cultivars, and growing requirements. Crape myrtle (Lagerstroemia) has long been a favorite in the hot, humid southern states. Tolerance for drought and urban conditions, disease- and pest-resistance, and year-round ornamental features make this one of the best for summer bloom in zones 6 and warmer. Cultivars range in mature height from compact 3-foot shrubs to 20-foot-tall trees. The University of Georgia and Clemson University Extension Services have handy cultivar lists, plus thorough cultural information.